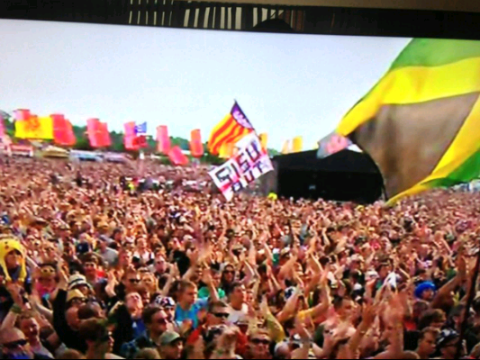 “SISU OUT” banner at Glastonbury. Disgruntled Coventry City fans have taken their protests against club owners SISU to Glastonbury; the largest music festival in the country. During live coverage on Sunday night on the BBC, a “SISU OUT” flag could clearly be seen amongst the crowd. The banner was picked out by the BBC television cameras who were beaming the pictures around the world, during The Editors’ performance. Yesterday, the Sky Blue Trust unveiled a ‘statue’ of SISU boss Joy Seppala outside the Ricoh Arena and earlier in the month they staged a protest outside SISU’s head offices in London. Many Sky Blue fans are urging the club to remain at The Ricoh Arena; with only five weeks until they kick off the 2013/2014 npower League One season away at Crawley Town before ‘hosting’ Bristol City a week later, City are still to confirm where they will be playing their home games next season, or are yet to reveal what kits they will be playing in. « Sky Blue Trust unveil faceless statue of Joy Seppala at Ricoh Arena.